Are you dead? You sure? It might seem absurd, but you very well may be according to your local county election office. Earlier this year Harris County resident and voter Walter Pinkston received a letter from his country election office requesting his family confirm his death or provide evidence that he was still alive. The letter claimed that if he did not respond with proof he was still alive he would be removed from the voter rolls and become ineligible to vote. Walter Pinkston isn't the only one. 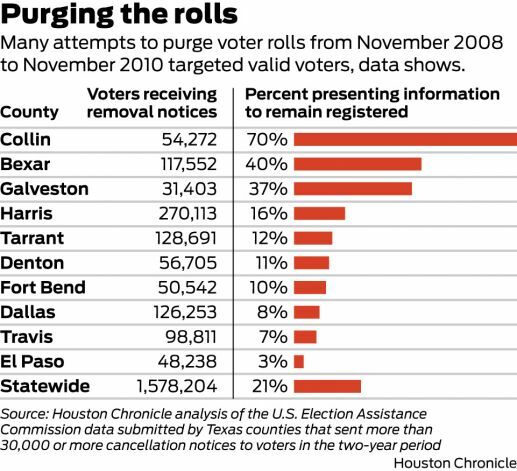 An investigation and analysis by the Houston Chronicle has revealed that between November 2008 and November 2010, more than 300,000 eligible voters were notified that they may be removed from Texas voter rolls because they were mistaken for someone else or failed to receive or respond to generic form letters. In addition, more than 1.5 million voters could be removed in the next several years if they don't update their records for two consecutive federal elections. Each year thousands of voters receive requests to verify voter information or be cancelled because they share the same name as a voter who died, got convicted of a crime or claimed to be a non-citizen to avoid jury duty. Those voters receive form letters generated by workers in county election offices that "therefore may be more subject to error," said Rich Parsons, a spokesman for the Secretary of State in emailed responses to the newspaper. Voters who fail to respond to form letters - or never receive them - get dropped. State and federal laws require the nation's voter rolls be regularly reviewed and cleaned to remove duplicates and eliminate voters who moved away or died. But across Texas, such "removals" rely on outdated computer programs, faulty procedures and voter responses to generic form letters, often resulting in the wrong people being sent cancellation notices, including new homeowners, college students, Texans who work abroad and folks with common names, a Chronicle review of cancellations shows. Statewide, 21 percent of the people who received purge letters later proved they were valid voters, compared with 16 percent in Harris County, according to a Chronicle analysis of the latest U.S. Election Assistance Commission data. Other counties had higher percentages: 37 percent of voters who received removal letters in Galveston County were valid voters, 40 percent in Bexar County and 70 percent in Collin County. Read the full article of the investigation by the Houston Chronicle.